The Kristall series of cameras are Leica II copies, made in the 1950s by Domenico Chinaglia of Belluno in north-west Italy. The earliest cameras were made for sale by Guido Nomini of Milan, and are engraved with GN.M in a triangle on the rangefinder superstructure, as on the first example at Westlicht, cited below. Later cameras are engraved for Chinaglia, with CD in a rhombus. Strangely, the first camera is the Kristall 2a. It has a focal-plane shutter with speeds 1/20 to 1/1000 second, plus 'B', which is synchronised for flash (except on early examples), with a PC socket on the front of the camera, and a cold shoe on the top plate. The viewfinder and rangefinder have separate eyepieces. The lens is interchangeable, with a standard 39 mm thread mount. McKeown lists the camera with a collapsible f/3.5 Steinar (engraved Kristall, so Chinaglia's own-brand lens) or Schneider Xenon, or an f/2.8 SOM Berthiot lens. The Kristall 2s has a top shutter speed of 1/500 second, but is otherwise similar. The Kristall 3s has slow speeds down to one second, on a separate dial, and the top speed of 1/1000 second. There are two types; the early one has a rangefinder supersturucture like previous cameras; the later type has a shaped top housing. The Kristall (or Kristall Standard, to differentiate it from the RF cameras) of about 1952, is a viewfinder camera. McKeown states that it is Chinaglia's version of the Wega, made after he took over its maker AFIOM; however, Dario Mondonico states confidently that AFIOM was in operation until at least 1956. McKeown notes that the camera body has the Wega's angular ends, whereas the preceding Kristall models are all round-ended. 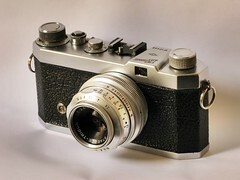 The Kristall 53 (of 1953) has an enlarged viewfinder window, with selectable frames for six focal lengths from 28 to 105 mm. 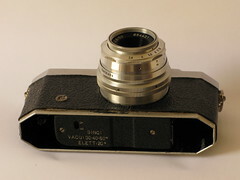 The rangefinder still has a separate eyepiece. It has the separate slow shutter speed dial. The Kristall R of 1954 does not have the slow speed dial; it has speeds 1/20 to 1/1000 second, plus 'B', on a single dial. It has the RF combined with the viewfinder in the same eyepiece. It has a larger RF window, which is tinted, and a larger top housing to accommodate this. The camera has both a PC socket and one for Vacublitz flash on the front. Later examples of the Wega cameras may have been produced by Chinaglia. Dario Mondonico suggests that those engraved with Chinaglia's <CD> mark may simply have been what remained in AFIOM's inventory when Chinaglia took over the company. ↑ 1.0 1.1 1.2 McKeown, James M. and Joan C. McKeown's Price Guide to Antique and Classic Cameras, 12th Edition, 2005-2006. USA, Centennial Photo Service, 2004. ISBN 0-931838-40-1 (hardcover). ISBN 0-931838-41-X (softcover). p201-2. ↑ Kristall 2a serial no. 00887, sold (with a KMZ Industar-22 lens) at the 24th Westlicht Photographica Auction, on 23 November 2013. ↑ Kristall 2a serialno. 976, with Steinar Anastigmat; lot 222 of the 30th Camera Auction by Westlicht Photographica Auction, 19 November 2016. ↑ Kristall 2a serial no. 01347, with SOM Berthiot 50 mm f/2.8 anastigmat, offered for sale but unsold at the 12th Photographica Auction by Rahn AG, on 9 May 2010. The auctioneer's notes state that this example of the camera has a stainless steel top housing, and is stamped with a K2 symbol, in commemoration of an Italian expedition to that mountain. ↑ Kristall 3s serial no. 11244, with Steinar 50 mm f/3.5; the earlier type, with the RF in a simple box superstructure. Offered for sale but unsold at the 12th Rahn Photographica auction. ↑ Kristall serial no. 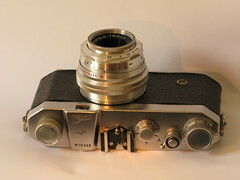 12490, with Adlenar 5 cm f/3.5, offered for sale but unsold at the 24th Westlicht auction. ↑ 7.0 7.1 AFIOM: notes on company history and pictures of a Wega and a IIa, at Dario Mondonico's Mistermondo site. ↑ Kristall 53 serial no. 11999, with Steinar 50 mm f/3.5, sold at the 24th Westlicht auction. ↑ Kristall 53 serial no. 11728, also with Steinar 50 mm f/3.5, offered for sale but unsold at the 12th Rahn Photographica auction. ↑ Kristall R serial no. 20166, with Krinar 50 mm f/3.5 (scaled in feet), sold at the 24th Westlicht auction. This page was last edited on 28 March 2018, at 05:08.